A bike computer, a handheld GPS or Locus Map dashboard? Soon after a man learns how to ride a bike and starts rolling first kilometers he gets interested in his speed, passed distance or how high hills he battled. And mainly the boys. Having thrown their pushbikes away, having changed to a decent bicycle and taking part on a ride with their dad they start nagging about some comp gear. It wasn’t otherwise with myself. Actually, there was a difference – I bought my first cycling computer long after my grad age as such gadgets weren’t available in my kids days. In the beginning the speedo-and-odo meter was enough but with growing tech development around grew also the taste to try all the new stuff. With the GPS coming also the navigation or track recording options emerged, sporttrackers brought heart rate or pedal cadence monitoring… The market today offers myriads of gadgets of various brands, equipped from elementary functions to hundreds of features for prices of a few bucks to hundreds dollars. And now, what to choose? Relatively simple device displaying elementary properties of the bike ride by monitoring movement of a magnet mounted on a wheel. Beginning with the most simple ones, providing just that speed and odometer, upto hi-tech devices full of sportstracking features for pro cyclists. The cheaper with wired transmission of data, the more expensive with wireless technology. Battery life, costly models full of functions in a tiny box, toughness of the wireless models, price of the cheapest around a few bucks, relative accuracy of monitored data. Vulnerability of wired models, miniature display – necessity to switch among displayed data… and of course no track recording, no navigation, position on map, geocaching guidance etc. A.k.a a receiver of global positioning system signal meant revolution in leisure outdoor activities after its leaving military-only area of usage. The early models offered just coordinates and altitude on a dark tiny display of a device resembling a brick not only by its shape. Since then the GPSies “civilized”, the display enlarged, overall dimensions diminished and a map was added. And of course many various features for outdoor sports – track recording, navigation, geocaching… All this in a compact robust device. However, quite pricey. Above all those connecting features of cycling computers, sporttrackers and GPS devices, for example the Edge by Garmin. Water, dust and shock resistance, relatively long battery life. Until recently unprecedented sensitivity to the GPS signal. 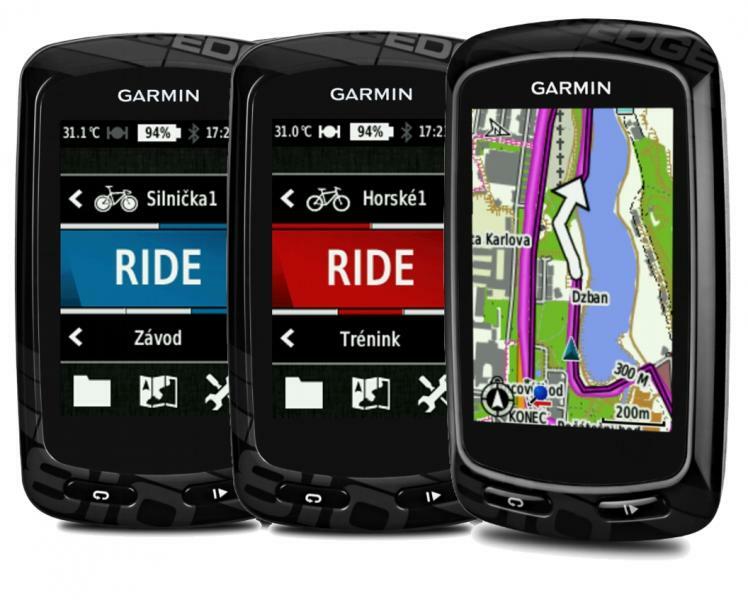 Also the most costly models are equipped by a quite small display (Garmin Edge 810 only 2,6″), narrow selection of maps, made usually only by the device producer or its exclusive partner. Today in the time of smart phones GPS handhelds are too single-purpose devices for a lot of money. The dashboard feature is available in the paid version of our application, Locus Map Pro. It enables to display the cycling computer functions and external sensors data such as heart rate, pedaling cadence etc. above a map of your selection on a huge screen of your smartphone. Together with outputs of other Locus Map features like track recording, navigation or guidance on geocaches. With help of the smart display switch before track direction changes you can save your battery life so the phone works for the whole time of your trip. All this for only 8 USD! What do you think, what kind of cyclocomp would you fetch for this price? Unbeatable price, universality, full customizability, there is no need of carrying a few boxes with you, you have everything in your phone, so while on a cycling trip you’re also taking pictures, listening to music or communicating with the outside world. The need to own an android smartphone 🙂 and a robust holder on the handlebars, preferably lockable, if you do not have a waterproof model. Top athletes will surely appreciate the amount of monitoring functions of advanced bike computers and sport testers for precise and detailed evaluation of their workouts, the possibilities of Locus Map dashboard will not be enough for them. On the contrary, children need the most simple and durable solutions, so they’ll be satisfied with a small cyklocomp. Expedition mountaineers and wilderness explorers will certainly prefer to take a robust GPS unit on their adventures. Well, and what about the rest? I think the answer is clear – Locus Map!